Electrobraid Fencing is attractive, easy to install, and very safe for your animals should they attempt to escape. The 50 foot spacing of line posts (yes, honestly – 50’) allows the tightly stretched strands of electrified braid to act like the ropes of a boxing ring, safely absorbing the force and returning the goat to the enclosure. Electrobraid Fence is also very accommodating for temporary fencing, or rotational grazing. At less than $200 for 1000 feet of Electrobraid, the braid itself and the ability to set your line post up to 50′ apart combined with the dramatically reduced labor time makes this fencing system very affordable. Maintenance of a Electrobraid fencing system is nearly non-existent and it carries a 25-year warranty against rust, rot, UV, weathering or breakage in normal use. 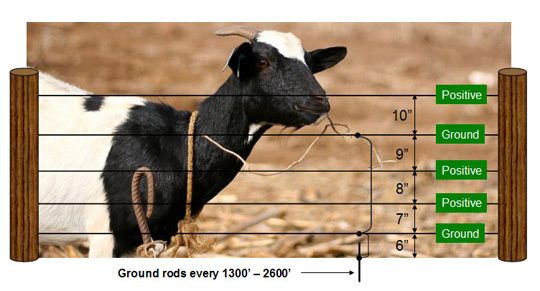 A five line fence is recommended for goat fence and sheep fence. Consisting of three positive lines and two ground. Extra grounding every 1300′ to 2600′ (particularly where soil is dry e.g. : hill tops). The Healing Barn’s Friendly Staff is ALWAYS Here To Help. Any Questions? Call us Toll-Free at 1-877-300-2638 We are always pleased to help. ElectroBraid™ is is an easily installed, permanent electric fencing system designed to provide a safe and secure livestock fence. It is strong and durable and a fraction of the cost of other electric fencing systems. This safe electric farm fencing can stand alone as a permanent perimeter fence, or moved around for rotational grazing, and can be used as a portable or temporary fence for horses, sheep, cattle and other livestock. It is also a very cost-effective fence to exclude deer, moose, elk, caribou, bear, coyote and other animals from crops, airfields and highways.